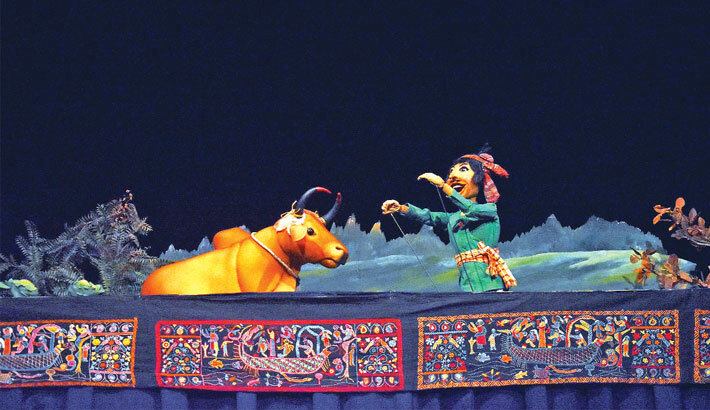 Marking the World Puppet Theatre Day, Bangladesh Shilpakala Academy organised a five-day puppet festival titled ‘National Puppet Theatre Festival’. Began on March 19 the five-day festival is underway at the Experimental Theatre Hall and Studio Theatre Hall of the academy. A number of 24 troupes from across the country are participating in this five-day festival. As a part of the festival, a discussion programme followed by an honourary award distribution ceremony was held at the Experimental Theatre Hall of BSA on Thursday evening. At the programme, Md. Siddiqur Rahman of Brahmanbaria was bestowed with the honourary award (Posthumous). Wife of Siddiqur Rahman was received the award on behalf of Siddiqur Rahman. Prominent artist Mustofa Monwar, theatre personality SM Mohsin, Jahangirnagar University’s Drama and Dramatics Department professor Dr Rashid Harun among others were present at the discussion while BSA Director General Liaquat Ali luckey presided over the programme. After the award ceremony, Multimedia Puppet Theatre of Dhaka and Puppet Lab of Drama Department of Chittagong University presented puppet shows at the event.